The Vicente Calderón Stadium (Spanish: Estadio Vicente Calderón [esˈtaðjo βiˈθente kaldeˈɾon]) is the home stadium of La Liga football club Atlético Madrid and is located in the Arganzuela district of Spanish capital Madrid. The stadium was originally called the Manzanares Stadium (Spanish: Estadio Manzanares [esˈtaðjo manθaˈnaɾes]), but this was later changed to the Vicente Calderón Stadium, after the famous Atlético club president. The seats are laid out in red and white stripes, the colours of Atlético's shirts. The stadium is located in the heart of Madrid, on the banks of the Manzanares. Vicente Calderón regularly hosts international matches of the Spanish national team. Since 2003, the Vicente Calderón Stadium has been classified as a 5 Star UEFA Elite stadium and was the first Spanish stadium to attain this classification. It has a capacity for 54,907. A notable, and rather spectacular feature of the Vicente Calderón, is that the M-30 dual carriageway, running from the South Node Toledo Bridge, passes below one of the grandstands. To finance the new stadium, Atlético Madrid had to make a debt issue in 1958 in the form of mortgage bonds that were underwritten mostly by club shareholders and members. 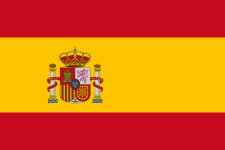 On 17 March 1961, Javier Barroso bought land for the construction of a new stadium, to replace the Estadio Metropolitano de Madrid. In the same year, work began on the new stadium. The ground opened in 1966, and was named the Estadio del Manzanares until 1972. The stadium from the exit of the players' changing room. On 30 July 2007, Atlético Madrid, Mahou brewery and Ayuntamiento de Madrid signed an agreement to reclassify the land that is currently occupied by the Vicente Calderón stadium and the Mahou brewery, agreeing that Atlético would move within 3 years to the Estadio Olímpico de Madrid, better known as Estadio La Peineta, which is currently being renovated in preparation for Atlético's tenancy. After reconstruction, La Peineta will hold 73,000 spectators and will feature fully covered stands. 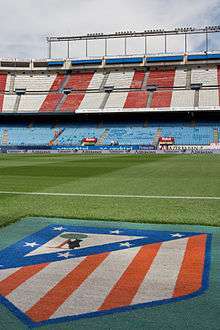 After the 2016/17 season, The Vicente Calderón Stadium will be demolished, and a park will be built in its place, which is to be named the 'Park Atlético Madrid'. Atlético will then move to La Peineta the following season. The decision to demolish the stadium was not well received by some of the Atlético fans who were against the relocation of the club, as they considered it to be a bad move if money was not being used to improve the club itself. The protests were led by the Save the Calderon Group and the Atlético Supporters Club: Asociación Señales de Humo. Vicente Calderón Stadium from southern goal. The Estadio Vicente Calderón is located on the banks of the Manzanares. In addition, the stadium can be accessed via the Madrid Metro. The closest stations are: Pirámides Station and Marqués de Vadillo Station, both of which are on Line 5 of the Madrid Metro. ↑ "Vicente Calderón Stadium". AtléticodeMadrid. Retrieved 30 January 2016. ↑ "Estadio Vicente Calderón". Soccerway. Perform. Retrieved 30 January 2016. ↑ "Estadio Vicente Calderón". Time Out. 10 April 2014. Retrieved 21 March 2015. Wikimedia Commons has media related to Vicente Calderón Stadium.